It could have been the sweltering Phoenix heat with temperatures hitting the triple digits. Maybe it was the milk maid accessories housed immediately next to my booth. It might’ve been the illo of Seashelly Dumpster on the Cool Jerk banner behind my table. 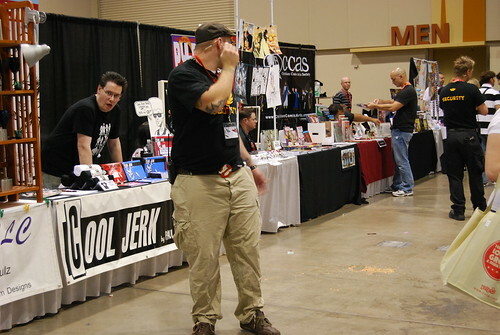 Whatever the reason, Cool Jerk was quarantined temporarily Saturday afternoon. Someone called didn’t make it to the big white telephone to call Ralph and instead dropped a round-trip meal ticket right there in the middle of the aisle, closing traffic for part of the afternoon. Fortunately, this reversal of fortune didn’t affect the many people who came out on Sunday and stopped by the table — many of whom are now new fans and friends of Cool Jerk. Updates on the Cactus Comicon to come later this week!